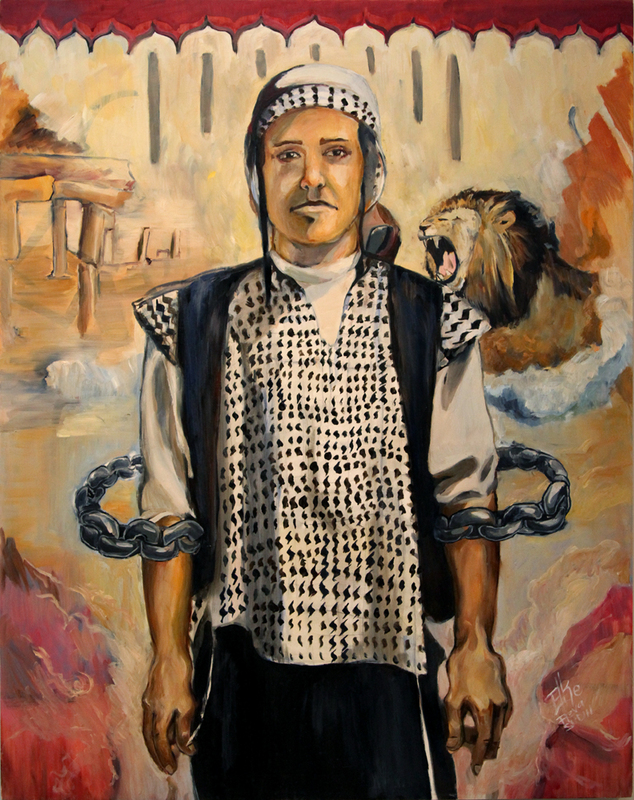 A Song of David, 2012. 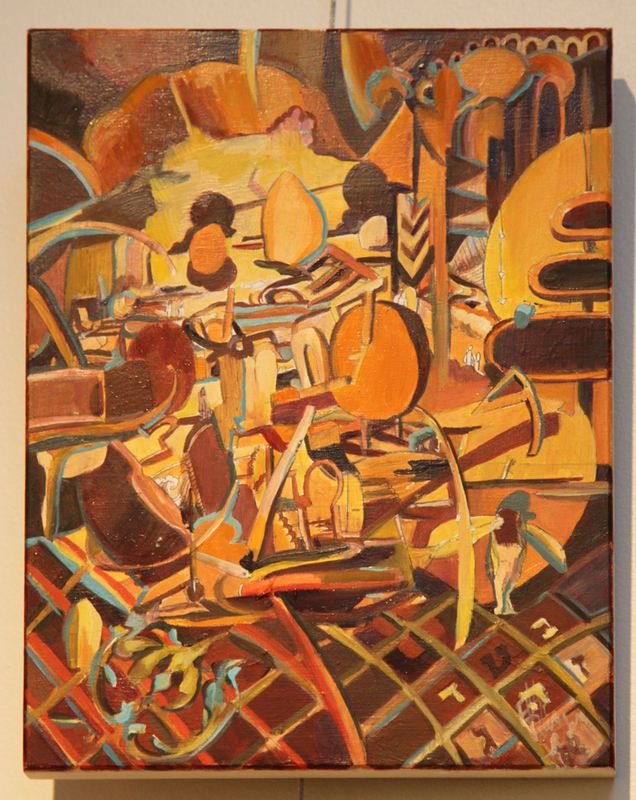 Oil on canvas, 30×40 in. Then: David was a person from humble beginnings who rose to power, eventually taking the line of Kings from his predecessor, King Saul. Before their falling out, David would play songs to soothe Saul’s disquietude and his music and poetry eventually formed the bulk of the Book of Psalms. He was a fierce warrior, and established Jerusalem as the capital of the Kingdom of Israel. Now: Basya Schechter is the leader of the band Pharaoh’s Daughter. 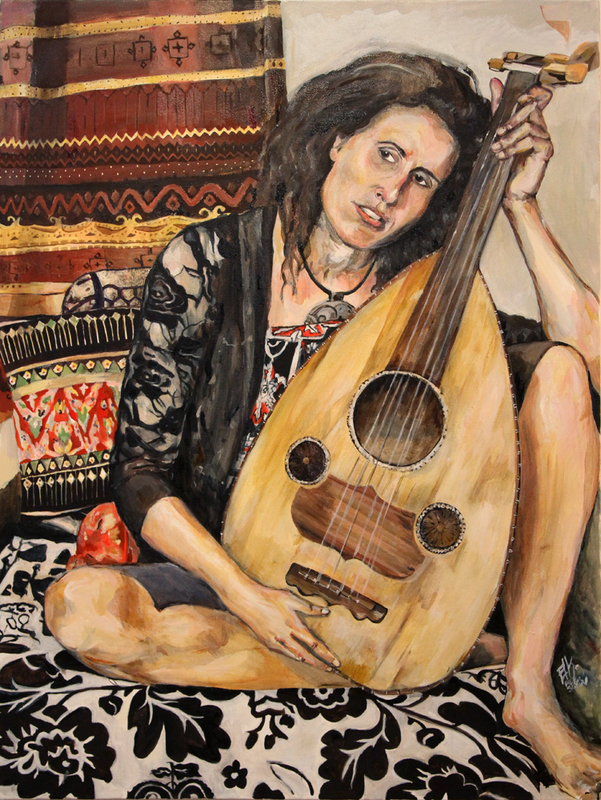 She plays the Oud, cited by Al-Farabi as the original musical instrument, and is inspired by Middle Eastern music and culture. 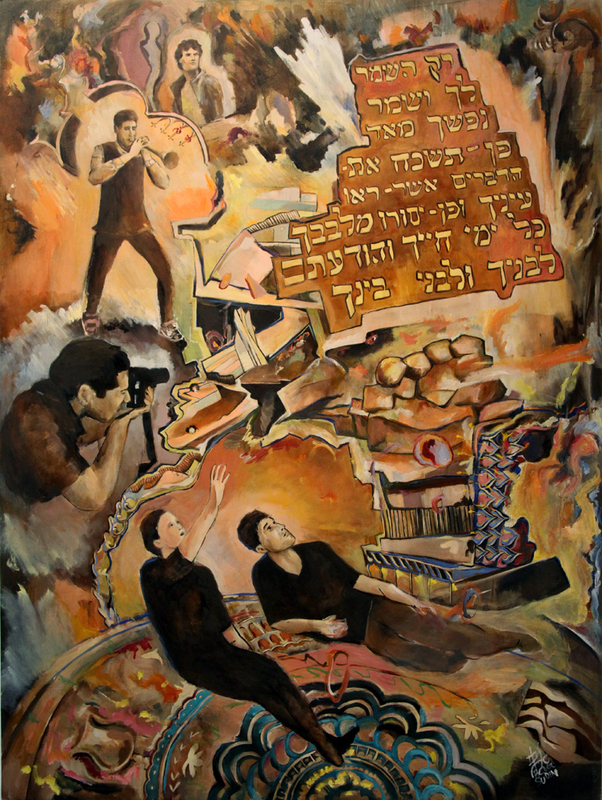 This painting reflects the yearning to connect to the culture of the biblical ancestors. Then: Deborah was a prophetess and judge, an important leadership position prior to the Israelite monarchy. She was known for conducting her business beneath a palm tree. 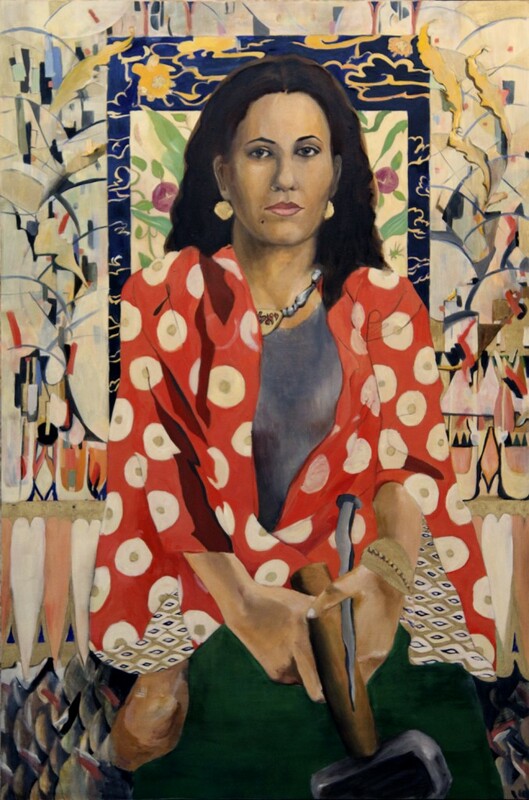 Along with Yael, she is recognized for being a strong, independent woman who was crucial in the Jewish victory against the Canaanite army under the command of Sisera. Now: Kylie Lefkowitz is a modern Jew and her sense of religious identity stems from a free Birthright trip to Israel. The candy striped background is reflective of her energetic and creative energy, complimenting her colorful dreadlocks. Then: Israel was the name given to Jacob after he spent an entire night wrestling with an angel, and the name was used from then on to refer to the Jewish people as a whole. His 12 sons, each becoming a tribe as they themselves fathered families, grew to be known as B’nei Yisroel, the children of Israel. Each tribe was given a specific blessing at Jacob’s deathbed, and they carried flags that flew a symbol related to their defining attributes. Now: East meets west as the figures from Jan Van Eyck’s Arnolfini Portrait are updated with African patterning, a Hindu representation of the multiple wives, and a Japanese composite of the symbols of the 12 tribes of Israel. The two central figures each have a hand with the traditional priestly blessing formation. 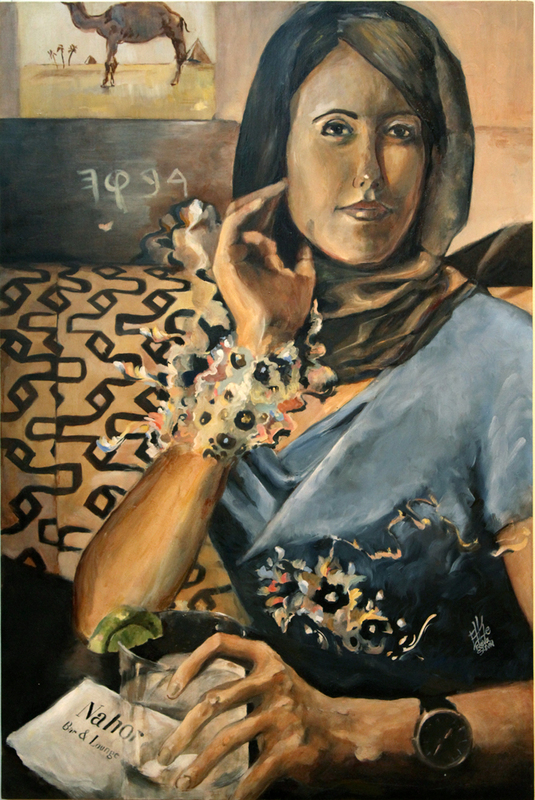 The faces are inspired by Mizrachi Jews of Yemen who have the most historically unchanged customs in Judaism today. In the center-left there is a string of letters from the ancient Paleo-Hebrew characters that spell out “B’nai Yisroel” or “Children of Israel” in a graffiti style. The letter yud from the end of B’nai and beginning of Yisroel is shared to show there is no separation between the original Israel and the descendants. Then: Joseph was sold into slavery by his brothers only to reemerge years later as the vizier of Egypt second only to the Pharaoh. When his brothers, who do not recognize him, come to him for food during a famine in Israel, Joseph eventually reveals his identity during an exchange over a distinctive goblet supposedly stolen from him by his younger brother Benjamin. Osnat was the wife of Joseph, an Egyptian woman who converted to Judaism and gave birth to Ephriam and Menashe, the only grandchildren of Jacob to become tribes of Israel. Some sources say she was the daughter of Potifar’s wife, who had tried to seduce Joseph and subsequently had him imprisoned. Now: Shais Rison is a blogger under the name MaNishtana (Why is this different?) who is a proud voice for Black Judaism in the Diaspora. His family can trace its Judaism back at least seven generations in America. His wife Guilenne is a media voice for mixed race identity. 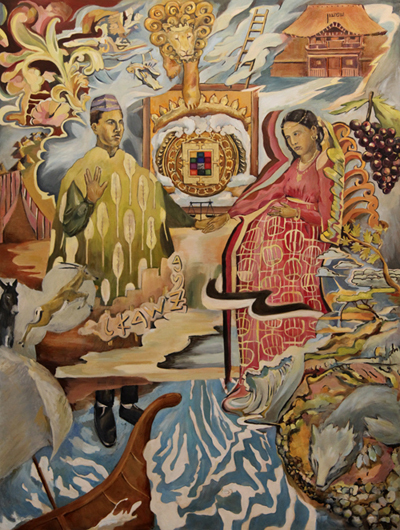 This painting portrays the couple during their engagement period. Then: Moses was the greatest of all leaders and prophets in Judaism. He led the Israelites out of their first exile in Egypt, and revealed the specifics of the Torah to them over their 40 years in the Sinai Desert. His death prior to entering the Land of Israel is usually attributed to hitting a rock to provide water for the people, instead of speaking to it, as he was commanded. Ethics of our Fathers begins with the statement that “Moses received the Torah from Sinai and gave it over to Joshua”, who passed the tradition on as well. Joshua led the Israelites back into the Land of Israel after their exodus from Egypt and became a definitive leader both in spirit and war. While the Torah is known as the “Five Books of Moses”, the first volume of Prophets is named for Joshua. Now: Rabbi Shlomo Yaffe is the permanent Scholar-in-Residence to Chabad at Harvard University, and Dean of the Institute of American and Talmudic Law. 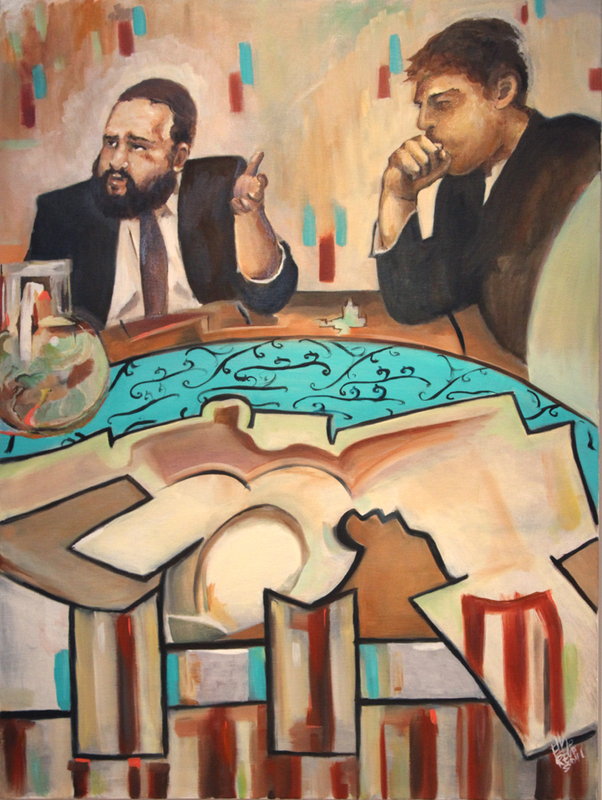 This piece depicts a contemporary Rabbi teaching to an entire class, but the save for one student, the class is not depicted. The patterning at the bottom is inspired by Sephardic Torah scroll cases that are hard and stand upright. The red, yellow, and turquoise coloring is inspired by Middle Eastern and south Asian color sensibilities. Then: Rebecca (Rivka) grew up as a righteous woman living among disingenuous people. One day at the water well in her hometown of Nahor, Eliezer, servant of Abraham, approached with his entourage and Rebecca kindly brought water not only to the men but to the camels as well. She was chosen as the perfect bride for Isaac, whom Eliezer had been sent to find. Her beauty is the trigger for a significant “love at first sight” moment recorded in the Torah, when she is brought back to Isaac and he spots her from a distance. Now: Social media expert Farrah Fiddler is sitting in a New York City bar with a “well drink,” waiting for a potential date to arrive. Paleo Hebrew letters floating that spell out the name “Rivka” beneath a Camel cigarette poster. Then: Samson was a Nazir, a man sworn to not eat grapes or wine, cut his hair, or go near a dead body. He possessed moments of intense strength and ferocity bestowed by the spirit of G-d, including the ability to rip apart a lion with his bare hands. Ultimately he was robbed of his strength when his hair was cut by Delilah and he died bringing down the pillars of a Philistine temple on himself and all those present. Now: Yisroel is a farmer and one of the founders of the Yiddish Farm located in upstate New York. He creates his own tzitzit, a ritual clothing item, from patterns he likes and turns them into hoodies. This still life is a study that accompanies the A Song of David painting with additional Middle Eastern patterning. 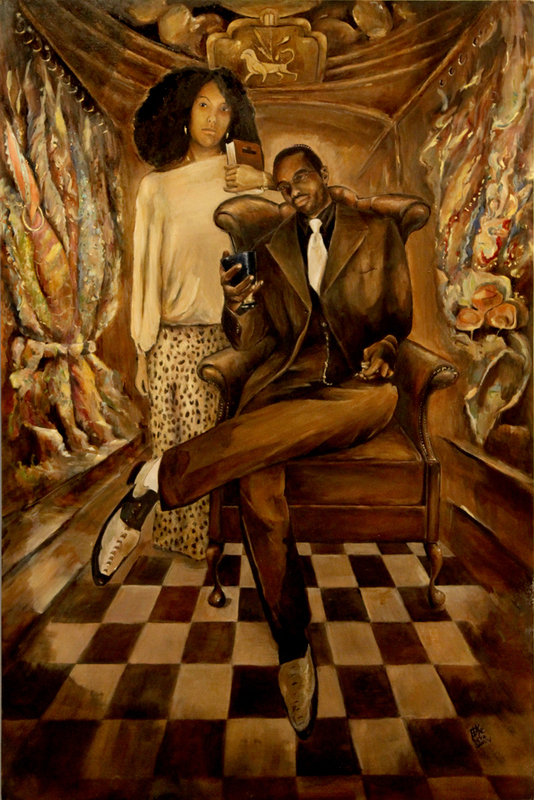 The subjects in the painting are customary items for the Sabbath including the kiddish cup and candle sticks. Then: Leah, Rachel, Bilhah and Zilpah were Jacob’s four wives. Jacob would take turns spending time in each of the wives’ tents and he fathered twelve sons between them all. The first four were born to Leah- Reuben, Simon, Levi and Judah. Reuben, the first born, lost his birthright because he improperly moved his father’s bed into his mother’s tent after Rachel died. Simon and Levi lost the birthright because of their overzealousness in rescuing their sister Dena from captors, though Levi would go on to rise up as the tribe of priests. The tribe of Judah eventually became the line of kings. Now: The Sidof family are Persian-American Jews. Their home is full of Persian décor and food. This scene depicts their family is a Shabbat afternoon as they lounge around in comfort and enjoying the holiness of the day. 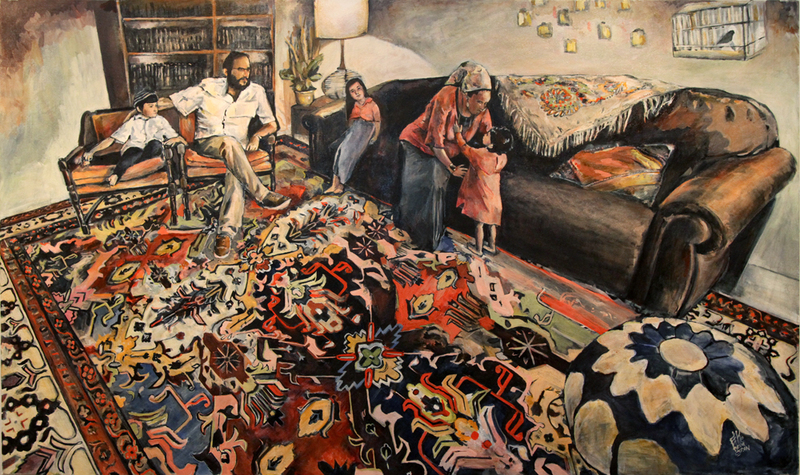 The composition draws your attention to their large Persian rug, which has been amplified in this painting and distorted so that the center shapes of the rug become flat in the composition. This distortion of space draws the viewer in to an alternate world, using almost pop-style designs but in a classical painterly space. Then: Abraham, the father of all monotheism, was known for his kindness. It is said that his tent would be open on all sides to welcome visitors from any direction. As a young boy he smashed the idols in his father’s store, pointing out their falseness by blaming the largest idol for the destruction. He went through ten trials throughout life to prove his loyalty to the one true G-d. Though he had many followers, it is assessed that they all left with the passing of Abraham. Isaac, son of Abraham, inherited the birthright of what would become Jewish tradition. He was almost willingly sacrificed like an animal as part of one of Abraham’s trials, but was saved at the last moment when Abraham’s mettle was proven. Now: Ahron Moeller is lead singer of the consistently underground band Blanket Statementstein. This scene depicts a calm morning prayer. 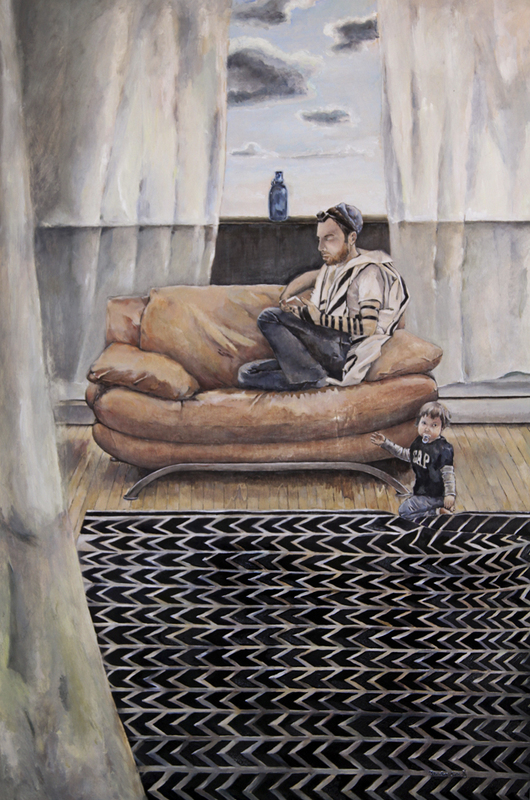 What makes it unusual is that although the subject is wearing a prayer shawl and tefillin (the ornaments on his head and hand), he is curled up comfortably on the couch at home. Prayer is an intimate act and so often it is taught as this stale repetitious aspect of religion without recognizing that it is about being a human being trying to reach out and find answers beyond themselves. Then: Aaron was the brother of Moses and first high priest (Cohen) of Israel, a calling that found him in charge of ritual sacrifices and the only person allowed to enter the Holy of Holies. The priests were known for their distinctive garb and accessories including an apron and shekhitah knife for sacrificing animals. Aaron was also renowned for being a marriage counselor to the Jews during their 40 years in the Sinai Desert. Elisheva was the wife of Aaron. Her name is often translated as “G-d is my oath”, possibly eluding to her unspoken role as the woman behind the man with the holiest role in Judaism. All Cohens, a role passed on the paternal side, which exist in the world are descendants of Aaron and Elisheva. Now: Moses and Shana Wendel are the owners of Pardes, an upscale kosher restaurant with inventive French-Mediterranean style cuisine, an unlikely combination for the glatt kosher crowd. Moses is the chef and his wife Shana takes care of booking and operations behind the scenes. Then: The text is taken from the Torah, quoting the words Moses says to the people of Israel that they (all generations) have witnessed the revelation at Sinai. Now: The characters in the painting are reflective of how a contemporary generation yearns to uphold this commandment and find ways of keeping the revelation alive for themselves and for others. The image explodes with color atop a sepia background. This piece focuses solely on the graffiti style illumination used in other paintings of this series and contains references to codes in Kabbalah while also utilizing Paleo-Hebrew blended with traditional Hebrew lettering. Then: Yael fulfilled the prophecy of Deborah and singlehandedly defeated the Canaanite army battling the Israelites by inviting their General Sisera into her tent. While he was laying low, she fed him milk and he fell asleep. In his slumber she took a hammer and tent peg and drove the peg so far through his skull that it dug into the ground beneath him. 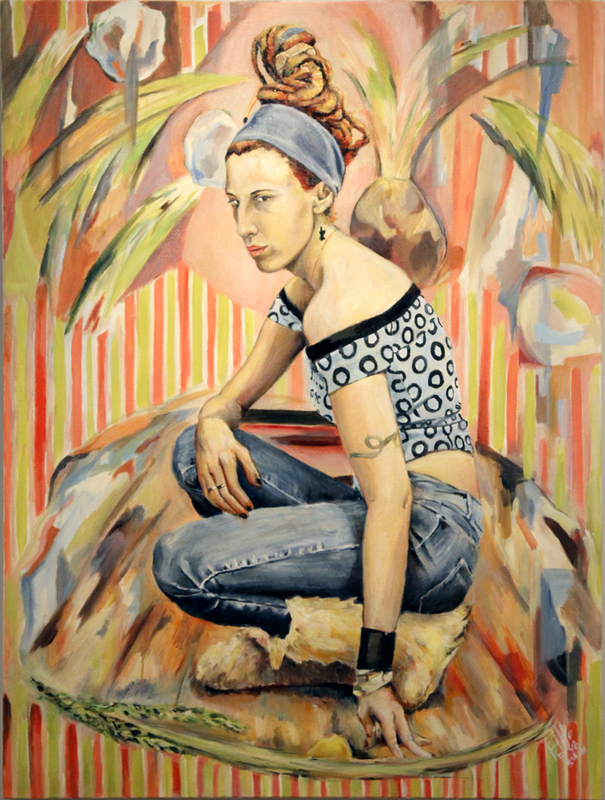 Now: Inspired by a photographic portrait of Frieda Kahlo, the identity was blended with contemporary Puerto Rican Jew and girl rocker, Emilia Cataldo. She is strong and non-apologetic about her identity, and uses her feminine mystique to defeat the General as alluded to by her pose and Japanese Geisha inspired patterning on her clothing and surrounding ornament. Jean-François Millet’s The Gleaners is twisted into a scene of modern Hassidic Jews from a small fringe group who are returning to traditional farming in upstate New York. 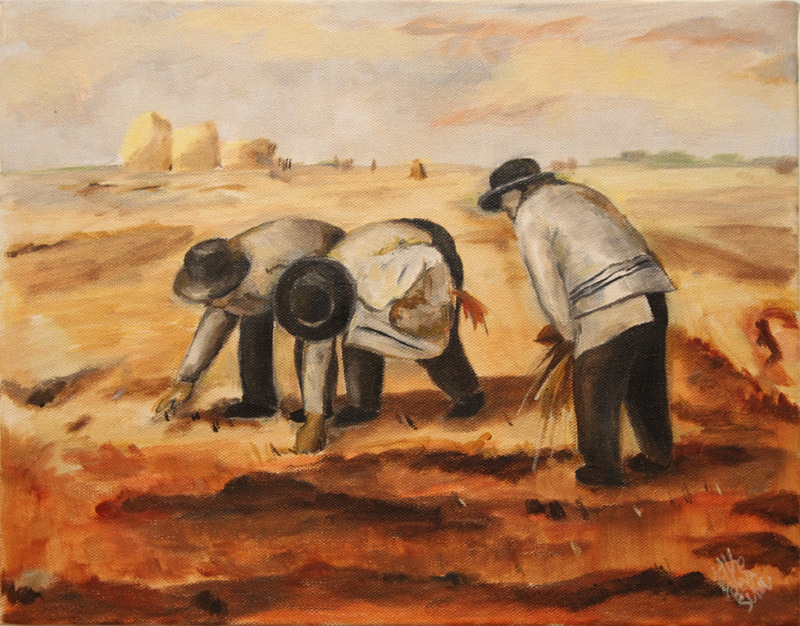 Farming plays an important role in Jewish law and custom, despite it not being a popular career today. The contrast between the warm lighting and the starkly black and white clothing show the difference between the rustic place we come from and the sterilized environment we live in today, and how we try to reconcile the two. We are Patriarchs evokes the legacy of Biblical characters and archetypes drawing them into the 21st Century with contemporary oil portraits that suggest classical European master painters by way of Anglo-Japanese Japonisme, and graffiti street art. 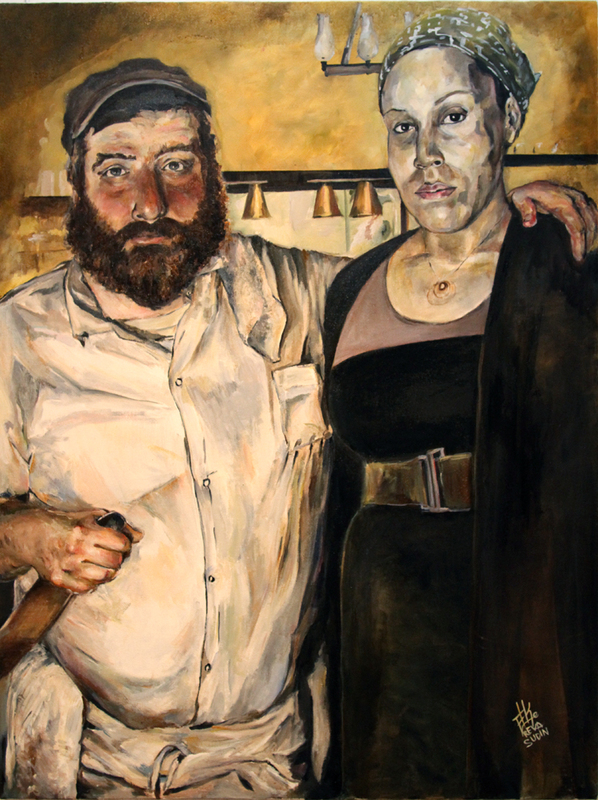 These 15 works display the multi-cultural melting pot of global Jewry from award winning gourmet chefs to renowned world musicians, bloggers, converts, Rabbis, and tattooed heroines all equally featured. Each is a representation of a prominent figure from the Hebrew tradition, leaders in their time who continue to inspire. The Bible states that there were 10 generations from the creation of Adam to Noah’s flood, and 10 more from The Flood to Abraham and monotheism. Sudin reinterprets this for a new era finding significance in the 10 generations from the Industrial Revolution to today. Modern technology has enabled the most informed, educated generation and yet we are lost in a sea of choices that ignore the wisdom of our predecessors. This series seeks to bring back a sense of continuity, to show a correlation between the ancient and the modern, and recognize that the steps in between have all played a role in how we live in this world. Every generation influences the next, and We Are Patriarchs of the future. “Elke Reva Sudin puts together all the things you wish you’d see more of in ‘Jewish art’: day-to-day life; devotion; conflict; transcendence. A young artist with a mission, Sudin doesn’t dumb down or aggrandize any one aspect of the Jewish experience — she just presents it as she sees it at this point in her life, with lots of respect, and almost no irony. Maybe that’s why we can always relate to the people in Sudin’s work. 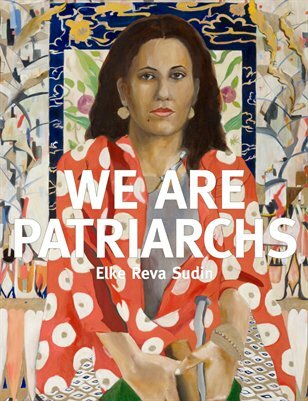 Richard Mcbee, We Are Patriarchs: Paintings by Elke Reva Sudin The Jewish Press. February 15, 2013. Sara Trappler-Spielman, What is Jewish Art? A Diverse Palette. Chabad.org. February 12, 2013.